Crooked teeth and bite problems are often solved with orthodontic treatment. Sometimes, even when teeth look straight, the upper and lower teeth may not fit together well causing a bite problem. Braces are the most common way to correct crooked teeth and bite problems. This brochure will talk about braces and other types of orthodontic treatment. 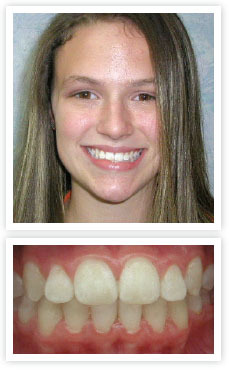 The good news is that orthodontic treatment can lead to a healthy, beautiful smile, regardless of a patient’s age. 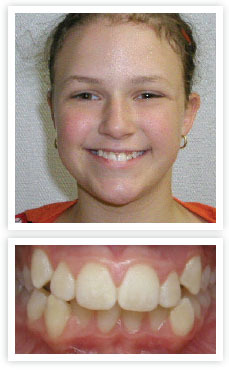 Orthodontic treatment takes time and patience, but the end result is worth it. There are different causes of a bad bite, also called a malocclusion (mal-oh-CLUE-shun). Sometimes a bad bite happens naturally. Thumb-sucking, losing teeth too early, or accidents also can cause a bad bite. • Crooked and crowded teeth are harder to keep clean. This may lead to tooth decay, gum disease, and tooth loss. • When teeth are in the wrong place, they may keep the jaws from developing properly. An uneven bite may make biting, chewing and speaking harder, cause excessive wear on tooth enamel, and lead to jaw problems. There are different types of orthodontic treatment that can be used to correct a bad bite. All use constant but gentle pressure to move teeth and align jaws. Braces consist of small brackets that are glued to your teeth. They have slots in which a wire is inserted, and the wire is held to brackets using tiny rubber bands (“ligatures”), or through a built-in mechanism that secures the wire (“self-ligating”). The wire, which is what actually moves teeth, is regularly adjusted to slowly shift your teeth and guide jaw growth in patients who are still growing. The brackets may be metal or tooth colored. Sometimes brackets are placed on the backs of your teeth, making them invisible. Braces are available for patients of all ages. Aligners (ah-LINE-ers) are made of clear plastic or acrylic and are worn over your teeth, placing gentle pressure on them to straighten them. Each set of custom-made aligners is worn for a few weeks. Then you get a new set to advance your treatment. This way, your teeth are slowly moved into the correct positions. Aligners are available for teens and adults. Aligners are removable and need to be taken out before you eat, brush, and floss. Be sure to follow your instructions on how long to wear them each day. When jaws don’t line up, teeth cannot be aligned properly. Some patients may have an upper or lower jaw that sticks out and causes their bite to be uneven. In some cases, patients may need braces or aligners in combination with surgery to achieve a healthy bite. Most people wear braces or aligners for one or two years, depending on the problem. Then they wear retainers that hold teeth in their new positions. You can expect a little discomfort during treatment. But today’s materials use a constant, gentle pressure that makes treatment more comfortable for the patient. When a child is about 7, he or she should have their teeth checked to see how they work together. If the child’s teeth or bite need treatment, it may be advantageous to get an early start. Treatment that begins while a child is growing may deliver results that cannot be achieved once the patient is done growing. Most treatment begins when patients are between 9 and 14. The type of treatment recommended will be based on the patient’s orthodontic problem, treatment needs, and desired results. Patients will receive instructions on keeping their teeth, gums and “appliance” (the formal name for braces and other devices that move teeth and align jaws) clean throughout treatment. No matter your age, it’s never too late to improve your dental health and beautify your smile. Many adults seek treatment to correct long-time problems or to correct changes that happened over time. Sometimes an adult’s treatment takes a little longer than a child’s treatment. • Keep your teeth clean when wearing braces. Brushing and flossing remove plaque, a sticky film of bacteria that forms on teeth. If plaque is not removed regularly it could lead to tooth decay or gum disease. • Go to all of your orthodontic appointments. If you delay any adjustments, your treatment may take longer. • Visit your dentist for cleanings and exams. It is harder to keep teeth clean if you have braces. So having regular cleanings at your dentist’s office is important. Your dentist will also check for tooth decay, gum disease, and loss of minerals in the enamel (called demineralization). • Eat foods that could get stuck in your braces or bend the wires. These foods include nuts, corn on the cob, popcorn, hard candy, ice, and sticky foods like chewing gum, caramel, or other chewy candy. Ask your orthodontist and dentist which foods to avoid. • Eat too many sugary foods. This can lead to tooth decay around the brackets that could permanently stain or damage your teeth. • Play sports and active games without wearing a mouthguard. A mouthguard can protect your mouth and jaw from getting hurt. Your orthodontist or dentist can suggest a proper mouthguard to wear with your braces.